No casualties or injuries have been reported so far. 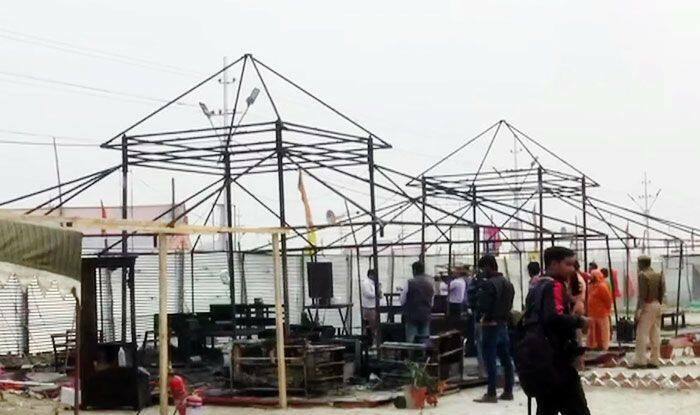 Prayagraj: A fire broke out in two tents at the ongoing Kumbh Mela in Prayagraj on Tuesday. The blaze was later brought under control. No casualties or injuries have been reported so far. On February 2, special arrangements were made to expedite the process of cleaning all drains here during the two-month-long Kumbh. Under the Namami Gange project of the Centre, a host of measures for sanitation as well as checking the flow of sewer drains into the Ganga river were put in place at an expenditure of around Rs 250 crore, said officials of the National Clean Ganga Mission (NCGM). “There are 46 big drains that flow directly in the river. Their flow has been checked and treated through bioremediation and polymer-based techniques to provide clean water for the Kumbh,” said Rajat Gupta, a special consultant with the NCGM. Kumbh is one grand affair which has been mentioned on the UNESCO’s Representative List of Intangible Cultural Heritage of Humanity. The usual Kumbha Mela is held after every three years, whereas the Ardha Kumbha Mela is held after every six years in Prayag and Haridwar. However, Purna Kumbha Mela takes place after every 12 years in one of those four places, based on planetary movements.